Overview: Within close driving distance of San Francisco and San Jose International Airports, a visit to Santa Clara will inspire you to see first-hand the innovations of the world’s technology leaders. Plus, the city is home to Northern California’s most thrilling theme park, California’s Great America and a historic California mission, Mission Santa Clara. Spend your day in Santa Clara learning about the technology that made Silicon Valley famous. Begin by visiting the Intel Museum and Intel Museum Store where you will be introduced to the micro-miniature world of computer chips. 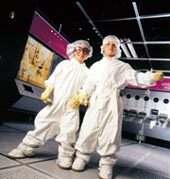 Hands-on exhibits offer an in-depth view of how computer chips are made and used in our everyday lives. Lunch at one of the nearby Mercado Santa Clara’s many eateries. From there, spend an hour or more touring through the three levels of the Tech Museum of Innovation. The Tech’s major themed galleries are packed full of unique, interactive exhibit’s detailing technology’s exciting future. End your day in Silicon Valley at the world class NASA Ames Exploration Center or tour Stanford University. One hour walking tours of the main campus are available. Admission is FREE to the Intel Museum and NASA Ames. The Tech Museum of Innovation and Stanford University have special group rates. Allow 7-8 hours. California’s Great America has the region’s best variety of coasters and exhilarating rides, plus concerts, festivals, and special events. The park offers the most kids’ rides and the most water rides in the region, plus Planet Snoopy, including a chance to meet Snoopy, Charlie Brown, and other Peanut’s characters. It is the only theme park in California to offer a complete water park inside – free with admission. In October, don’t miss the theme park’s “Halloween Haunt,” voted the “Number One Halloween Event in the World” by Amusement Today. Meal coupons and special discounted rates are available for groups of 15 or more. The Park is open from late March through December. Shop Silicon Valley at world-class outlet centers, upscale shopping malls, or electronic superstores. Spend hours browsing through the largest collection of manufacturer and off-price outlets in Northern California at the Great Mall. From there, it’s just a short drive to the valley’s most upscale shopping malls: Westfield Valley Fair and Santana Row. Both malls feature luxury retail, unique specialty shops, and restaurants. Lunch and continue your day of shopping at the Stanford Shopping Center where you will find a number or restaurants and cafes – all in an exquisite outdoor setting. Beautiful gardens, adobe walls, and California’s oldest institution of higher learning can be found at Mission Santa Clara de Asis, the eighth of the 21 world famous California missions. 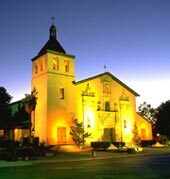 Founded in 1777 by the Franciscans, Mission Santa Clara de Asis was dedicated by Father Junipero Serra. Later, the Jesuits opened a school on the mission site, which is now Santa Clara University. After your tour through the mission, see the surrounding Mission Gardens. The garden’s pale yellow barksia rose and purple wisteria date to the 1800’s as do the olive trees on site. Allow 1 hour. Time permitting, visit other Santa Clara Heritage/Historical sites.